Join the discussion on our forums! Come discuss Mass Hysteria over in our dedicated Mass Hysteria discussion topic. This should probably seem pretty obvious, but the attacks can trigger secrets. I play Mysterious Challenger in Paladin for nostalgia in Wild, and I've seen my minions being left alive, often by Autodefense Matrix, and if one dies, but another lives, it will trigger an active Avenge. In a couple of cases, this card has left my Priest opponents even more behind on board control on account of the extra Divine Shield and Avenge buff. All in all, be aware of secrets when playing this, and that also probably goes for the other secret classes as well. That flavor text made me snicker more than it should've. Props to you, flavor text dude. 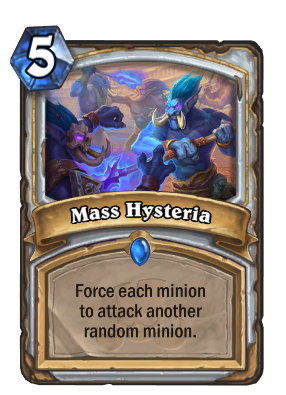 My question is, will Priest ever get a spell stronger than Psychic Scream. Yep. Absolutely crazy card. I always run 2 of these in my Priest decks and Lightbomb. A more situational Brawl. Sometimes you will clear the board. Sometimes you won't kill a thing. I like the skill test of setting this up though, much like Defile. On the plus side you can attack and weaken or kill off things then play this and get better outcomes. Heh, priest no longer needs to steal Brawl from warrior. This card reads "Force each minion to attack another random minion". So... can this make enemy minions attack other enemy minions? NVM. Just saw the Wronchi Animation revealing this. Now this is what Brawl should have been!! It says force each minion, so you could probably end up with six fights with six minions on the board. Fewer if they die before they can get their attack in. - Each individual minion that still has positive health initiates an attack on a random other minion. Higher-health minions are more likely to receive multiple attacks as the target list thins. - You can end up with a cleared board if the last attack kills both minions. - Zero-attack minions DO participate, dealing no damage but receiving it. - Lifesteal minions can of course trigger multiple times if they survive one or more attacks as well as doing their own swing. - Deathrattles evaluate after all attacks are completed, so deathrattle-spawned minions do not participate (as with Brawl). If aggro pressures Priests enough that they would die waiting to be able to cast Psychic Scream, they will run this.